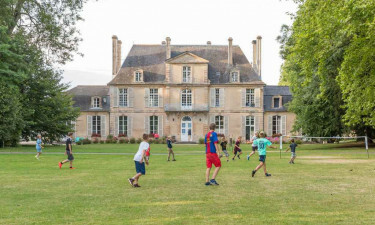 For families and couples looking for a quiet getaway, Chateau de Martragny offers a window into the bucolic Normandy region from the spacious grounds of a charming 18th-century Castle. With 4-star services and comfortable facilities on this luxury camping site, history buffs can explore the area's famous war landing beaches and medieval sites. Just 14km from the nearest Normandy beaches, there are choices to swim at sea or on-site with an outdoor pool. Situated in the heart of Normandy and just 7km from the medieval town of Bayeux (of tapestry fame), Chateau de Martragny offers country charm with aged stone features and a park setting. There are numerous activities and services on site for families and couples alike, with many attractions in the Normandy area. Book your camping holiday with LuxCamp. Swimming facilities overlooking the castle. Fishing in the nearby pond. Bar, restaurant and shop on site. With swimming, cycling and table sports, children will also love the on site park and gardens which provide ample room for exploration, fun and games. 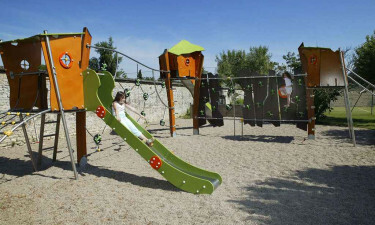 With children's playgrounds, paddling pools and a library, there is something for all seasons! With an on site bakery, shop and bar, visitors needn't venture off site. For adventurous guests, pony treks, kayaking, bungee jumping and more are both available and organised.